Island Alum Root is a rare perennial that is native to the Channel Islands and is the largest of the native alum roots. It forms 2 foot by 2 foot clumping rosettes of large dark green leaves that are often red tinged in the winter. In the spring, spikes of white to pinkish flowers rise 1 to 2 feet above the foliage in a light and foamy mass. Plant it in full sun on the coast and in light shade inland. Island Alum Root is the perfect plant for under mature oaks in woodland gardens, and it also looks lovely at the front of mixed borders, along paths or in containers. This plant tolerates clay and alkaline soils. 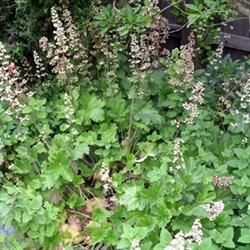 Heuchera needs water about 2 times a month along the coast and about 3-4 times a month inland. Hummingbirds adore the delicate blooms! This is a must for woodland gardens.